After 18 years of negotiations, the Church of Jesus Christ in Madagascar was founded in 1968 through the union of three churches which arose out of the work of the London Missionary Society, the Paris Missionary Society and the Friends Foreign Mission Association. It is the largest Protestant church in the country. The department has its own articles of association and its own internal regulations. 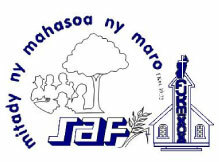 SAF/FJKM is a Non Governmental Organisation that operates at the national level. It has thirty years of experience in rural development actions in Madagascar. SAF has implemented a number of ACT appeals in the past, including post cyclone interventions and interventions during drought and cholera epidemics.